ATR 72 ASW is produced by Alenia Aermacchi. Image: courtesy of Alenia Aermacchi. 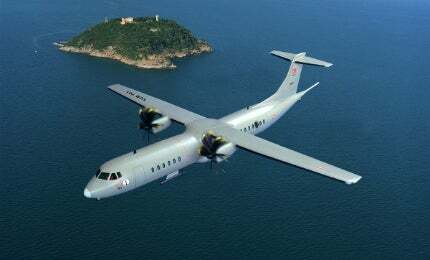 The ATR 72 ASW has been selected by the Turkish Navy. Image: courtesy of Alenia Aermacchi. ATR 72-600 served as the base platform for ATR 72 ASW. Image: courtesy of Laurent ERRERA. The ATR 72 ASW (Anti-Submarine Warfare) is a multi-role, special mission aircraft based on ATR 72-600 modern regional turboprop aircraft from Alenia Aermacchi. The aircraft is designed to perform anti-submarine and anti-surface warfare (ASuW) missions. It can also be deployed in maritime patrol, search and identification of submarines and search and rescue (SAR) operations. Reconfiguration of the aircraft can take place to perform missions such as protection of territorial waters, anti-piracy, anti-smuggling, monitoring and intervening of environmental disasters. It can also be used to protect the sea and coastline. The ATR 72 ASW has been selected by The Turkish Navy for maritime patrol and personnel / cargo transportation. The Italian Navy meanwhile has acquired four ATR 72 aircraft offering maritime patrol capabilities, along with provisions for the ASW capabilities. ATR 72 MP, which is the maritime patrol variant, has been ordered by the Italian Air Force. The five Nansen Class anti-submarine warfare frigates were built by Navantia of Spain for the Norwegian Navy. The ATR 72 ASW features a flexible, modular design incorporating a semi-monocoque fail-safe fuselage. Its airframe and tail section are made of composite materials. The basic ATR 72-600 aircraft has maximum take-off weight of 22,800kg, maximum payload weight of 7,300kg and operational empty weight of 13,311kg. It can carry a maximum fuel load of 5,000kg and can accommodate up to 70 passengers. A flight-operable door/rear belly hatch is attached to the ASW aircraft to drop paratroopers or emergency kits. Large observation windows and specific additional systems can also be fitted to the aircraft. The ATR 72 ASW aircraft features a new glass cockpit and a mission system integrated with digital flight avionics. It’s cockpit is fitted with five wide LCD screens, an Automatic Flight Control System (AFCS), FMS220 flight management system and a Multi-Purpose Computer (MPC). The aircraft is attached with a mobile turret mounted with electro-optic (EO) system for real-time tactical situation awareness. Thales AMASCOS (Airborne Maritime Situation & Control System) mission system and AIS (Automatic Identification System) will be fitted to the ATR72-600 TMPA. It will also feature a Link 11 / 16 data-link and broadband satellite systems. This will be used for the transfer of data in real-time to the ground command and control centres, as well as other platforms, both in air and on sea. The ATR 72 ASW aircraft can be armed with anti-ship missiles and torpedoes to attack underwater threats during anti-ship missions. Two pylons on either side of the fuselage can carry anti-submarine torpedoes. Also fitted are a sono-buoy launcher and an ASW weapon release point calculator. The aircraft’s integrated self-protection system consists of search radar, chaff & flare dispenser, radar warning, depth charge, missile warning and laser warning systems. It also incorporates ESM (Electronic Support Measures) and MAD (Magnetic Anomaly Detector) sensors to identify and track threats. A new generation weapons system mounted with MK 54 and MK 46 lightweight torpedoes can be carried by the ATR72-600 TMPA variant. The ATR 72 aircraft is powered by two PW 127M turboprop engines developed by Pratt & Whitney. Each engine driving a Hamilton Standard, six-bladed 568F propeller generates a power of 2,750shp at 1,200rpm. The power plant offers enhanced performance in hot and high conditions. A maximum cruise speed of 510km/h can be achieved by the aircraft, as well as a maximum range of 825nmi. It can climb at a rate of 1,355ft per minute and can remain airborne for about 11 hours. "The ATR 72 ASW features a flexible, modular design incorporating a semi-monocoque fail-safe fuselage." The Turkish Undersecretariat for Defence Industries (Savunma Sanayii Müsteşarlığı (SSM)) released a tender in 2001 for the procurement of maritime patrol aircraft, featuring maritime surveillance capability and onboard mission equipments. These will be used by the Turkish Navy. The Defence Industry Executive Committee (DIEC) signed a contract with Alenia Aermacchi for the Meltem III programme in July 2005. In July 2012, Alenia Aermacchi and SSM signed an amendment agreement for the delivery of two ATR 72-600 TMUA (Turkish Maritime Utility Aircraft) and six ATR 72-600 TMPA (Turkish Maritime Patrol Aircraft). The original contract was signed between the Turkish government and Alenia Aermacchi for the delivery of 10 ATR 72-500 anti-submarine warfare aircraft, which are now out of production. Alenia Aermacchi signed an agreement with Turkish Aerospace Industries (TAI) for modification of six ATR 72 aircraft into ATR 72-600 ASW TMPA configuration in mid-2012. The six aircraft are being modified by TAI in Ankara, under the Meltem III programme. The first ATR72-600 TMPA will be delivered in February 2017 and all the deliveries scheduled for completion by 2018. Raytheon was awarded a $5.7m contract by Alenia Aermacchi in July 2014 for providing engineering services support for weapons integration for the ATR72-600 TMPAs over a period of 31 months.